Marketing Writing Bootcamp is #Blogchat’s Sponsor For May and June! 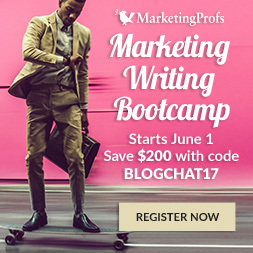 I’m thrilled to announce that #Blogchat will have a repeat sponsor for the next two months as Marketing Writing Bootcamp from Marketing Profs returns to sponsor #Blogchat in May and June! the Marketing Writing Bootcamp launches on June 1st and features 13 classes and SEVEN hours of advanced learning that’s designed to greatly improve your business writing skills. And yes, there’s even a class devoted strictly to improving your business blog! Click here to view the courses offered, and as a special bonus, Marketing Profs has offered #Blogchat participants a special $200 discount! Click that link to get the Marketing Writing Bootcamp for only $395! Thanks to your continued support of #Blogchat, we can continue to attract wonderful sponsors like Marketing Writing Bootcamp who can offer special deals and value for our community. And other areas of course. The fun begins at 8pm Central, Sunday May 7th! We’ll have a couple of members of the Marketing Profs’ team joining us, be sure to follow @ laurencwebster and @msnods as they will be interacting and there to answer any questions you may have about the Marketing Writing Bootcamp. Click here to review the course lineup and save $200 on registration, a special #Blogchat discount just for you!